It recently came to our attention that BPI Sports was making an exclusive line for their #1 retailer: GNC. So far, no other website has gotten all of the details on this new line, but, we’re not just any bodybuilding website… We’re bodybuilding website ninjas. And with our expert skills, we got our hands on the formulas for BPI Sports new BAM Pre Workout, Amino Strong BCAA, and Niagenix fat burner. Sadly, the Testex test booster is still unreachable even to us (2/4/2017). So are these new BPI Sports GNC Exclusive supplements going to be any good? Let’s evaluate the ingredients and see! BPI Sports BAM pre workout is a moderate stim energy supplement with some pump inducement. Each serving is 9 grams, and you get 25 servings per tub. Of that 9 gram serving, a little over a gram is flavoring – using sucralose as a sweetener. With that being said, while sucralose isn’t very healthy – this product should taste quite fantastic. So, even if it tastes good – is BPI BAM going to be a good pre workout? BPI BAM is going to be comparable to Cellucor C4 as well as Muscletech Anarchy. Both of these pre workouts are similar in the total dose of caffeine used, as well as accessory ingredients. Digging deeper, will BPI BAM offer a pump? Three grams of citrulline isn’t a ton… But it will help you have a natural pump while you lift in the gym. Pair that with the yohimbe in this product, and you should get a swell on. It isn’t going to be like a TL BULK pump, but it will still happen as long as your not dehydrated, low on sleep, or malnutritioned. 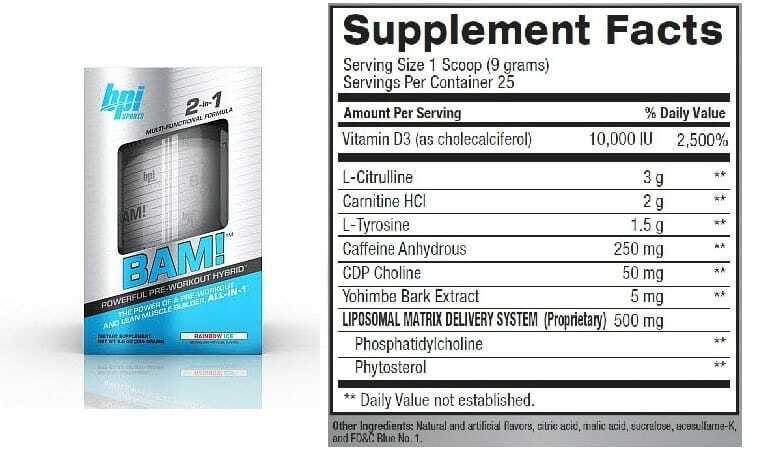 BPI Sports boasts that BAM is cutting edge since it contains phosphatidyl choline in a liposomal delivery system. This, really isn’t too big of a deal and to us, doesn’t warrant any hype or unique points. 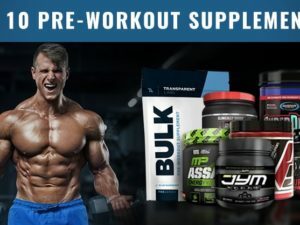 So, who is this pre workout most suitable for? If you are a beginner and walk into GNC for your first pre workout, then BPI BAM is going to be absolutely awesome to you. Likewise, if you’ve only taken C4, Anarchy, or other small dose pre workouts… Then it will be brilliant all the same. However, if you are an experienced lifter who has taken things like Pre-Jym or even Labrada Super Charge… Then BPI BAM isn’t going to impress you at all. 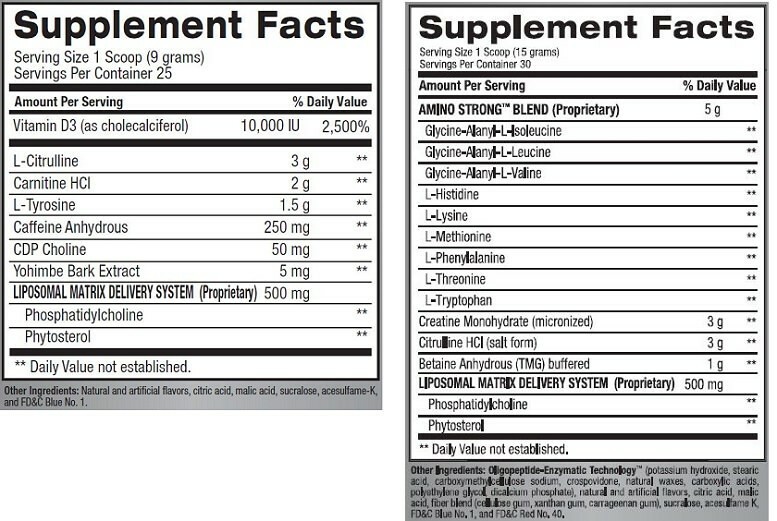 So, to be clear – Amino Strong is not really a BCAA supplement. Instead, it’s an essential amino acid supplement that also includes creatine, citrulline, betaine, and more phosphatidyl choline. On its own, BPI Amino Strong is like a scatter-shot low-dose creatine supplement with added pump. 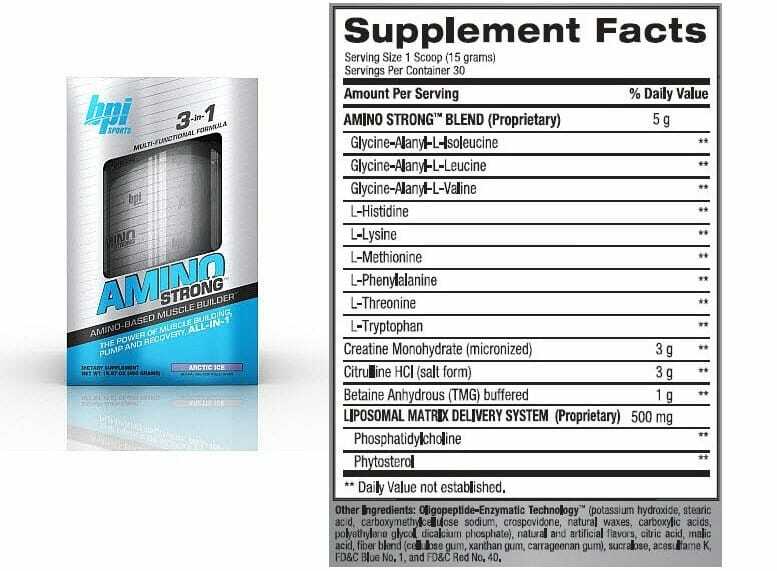 However, we can see that Amino Strong was without a doubt, made to be taken with BPI BAM as a stack. When you combine these two products, you hit the right pump threshold for a great workout. Just take a look. When should you take BPI Amino Strong? BPI Amino Strong will go best pre workout alongside BPI BAM. However, you can also take it intra-workout or post workout for recovery. That’s really all that needs to be said about BPI Amino Strong. Five grams of essential amino acids, a low dose of creatine monohydrate, some citrulline malate, and a low dose of betaine anhydrous… At least it will taste good though, right? On the bright side… Double dose this product for a decent stimulant free pre workout! We suspect that Niagenix is going to become a pretty popular fat burner, based upon its ingredient profile. Not entirely because it’s going to help you burn a ton of weight, but instead because a lot of the ingredients are going to make you feel good. For starters, we have a huge dose of vitamin D3 (10,000% Daily Value). Now, we are in massive favor of vitamin D supplements and their benefits. But, as we explain at the end of that article – it is possible to take too much vitamin D. And, 10,000% DV for 30 days straight is definitely questionable. To make matters worse, BPI BAM also contains this 10,000% DV dose, so, if you are taking both products then you are at 20,000% DV. That’s too much Vitamin D man! But this is where our overall beef with Niagenix ends. The rest of the formula is generally, standard practice for fat burners. The only thing that doesn’t make sense, is why they didn’t include yohimbe in this product like they did in BPI BAM… Since after all it is one of the most effective fat burners. The main benefits of Quercetin are reductions in inflammation, as well as cleaning out arterial plack. In addition to this, some believe that Quercetin can help burn fat, but this was mostly disproved in a 2008 rat study. While that’s a bummer, there is hope. In our opinion, any anti-inflammatory is valuable during weight loss. So we are glad to see it here, since losing weight can be a stressful experience on the body as you adjust your lifestyle and get back on track. Virtually all of the most effective fat burners contain caffeine in them. After all, it improves energy, mood, and burns fat! However, 300 mg is a bit high for most users – so we recommend skipping the morning coffee if you plan on taking BPI Niagenix. 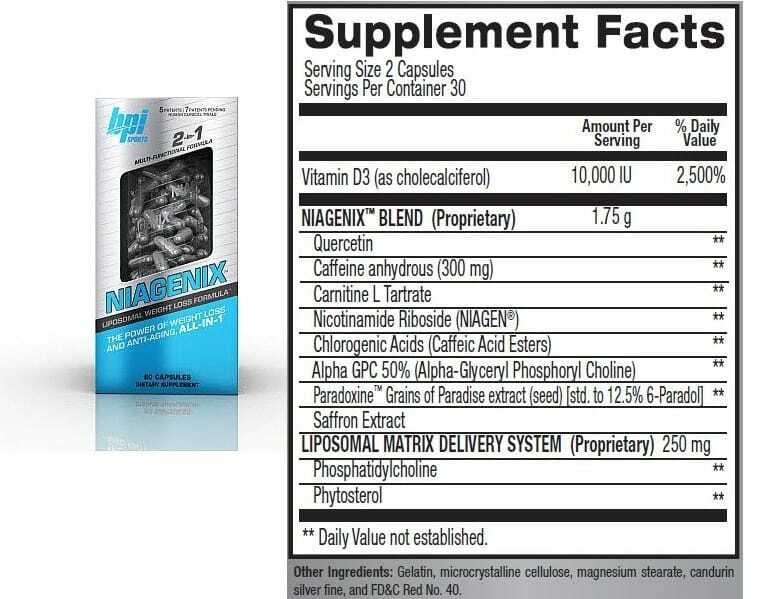 In this fat burner, BPI uses the caffeine anhydrous form of caffeine. While most people do not need L-carnitine, since the body produces enough of it naturally, those deficient in L-carnitine from malnutrition or intense exercise can improve fat metabolism via supplementation. 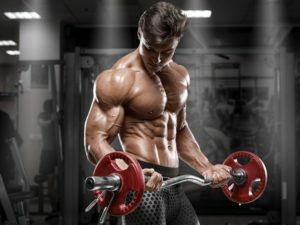 We haven’t written about L-carnitine yet, but you can learn more on Examine.com’s Carnitine review. Niagen is a special patented form of Nicotinamide Riboside that is believed to increase mitochondrial metabolism as well as boost communication between cells and their mitochondria. It is hypothesized that this may boost lifespan, energy, and fat metabolism… But research is still sparse. Though you can learn a bit more about Niagen in this press release. These are sources of choline, which raise acetyl-choline levels. This will make you feel good, reduce fatigue, and potentially burn fat… But we’re not 100% convinced on that. Paradoxine, also known as Grains of Paradise, is an ingredient used in many large-brand pre workouts. I is believed that this ingredient burns fat and boosts energy – but very little research has taken place. With that being said, we cannot make a strong prediction on its inclusion benefits. Overall, this is an interesting fat burner, and probably the best of BPI’s new product line. Though we are unable to determine its overall effectiveness, since well, it hasn’t been released yet – we are not disappointed. That is a big statement to make, since we really hate most fat burner products. Overall, the new BPI line made for GNC isn’t too bad. But, it’s quite clear that they kept the products relatively inexpensive to make, and therefor suppressed. If they would have just added more to each one, this could be a serious product line release… But instead BPI Sports appears to be lining up for a large marketing budget instead. Only time will tell, and we look forward to ordering these products for our official review!